John (Cap) and Marianne Andrews founded Adventure Unlimited on the principle of being spiritually minded. The practical and effective application of Christian Science is as much a part of our mission today as it was under Cap and Marianne Andrew’s leadership. To inspire a love for God and a willingness to turn to Him in prayer. To provide recreational adventure, leadership, service, education and community activities that foster spiritual growth and healing in an environment where Christian Science is lived. The ongoing strength of our spiritual resolve started with a most fundamental process, setting organizational goals which benchmark our progress to measure success. The desire to spiritualize each idea as our starting point and foundation has led to blessings that are immeasurable. We’re excited to share and invite you to read our fiscal year 2018 Organizational Key Results & Priorities. 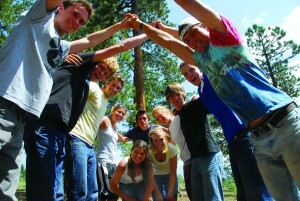 Every five years, Adventure Unlimited drafts a strategic plan that serves as a roadmap to guide the organization, unite key stakeholders with a common vision and language, provides perspectives and benchmarks to ascertain progress and propel the organization forward, all aligned to fulfilling our mission of “Opening Windows to God” for generations to come.